Check out the all-new 2019 Hyundai Sonata at Ken Vance Motors in Eau Claire, WI. 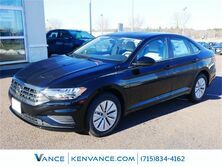 Check out the 2019 Volkswagen Jetta SE at Ken Vance Motors in Eau Claire, WI. Check out the all-new 2019 Honda CR-V LX for sale at Ken Vance Motors in Eau Claire, WI. Check out the all-new 2019 Audi A3 Premium Plus for sale at Ken Vance Motors. We highly recommend asking for Jason C. when you go to Ken Vance Motors! He really listened to our needs for our new car, (Even when my husband and I were looking for different features!) and came up with the perfect car for both of us. He was so knowledgeable about all the brands, models, and options. Even after we drove away in our new car, he made sure we were ... satisfied and answered questions I had about features on the vehicle. He was very honest and did not pressure us in any way. I would highly recommend working with Jason and I just love my new Hyundai! mike mckillip was my sales man. My experience with kenvance went well mike did well at his job any questions i had he answered with the best of his knowledge. Was here awhile before getting approved but he talked an made us feel like at home. you have a wonderful sales man on your team. Rolland Brown was very friendly and helpful and everybody explained things and made it understandable. Welcome to Ken Vance Motors, your family-owned Audi, Honda, Hyundai, and Volkswagen dealer right here in Eau Claire. Whether you are looking for a new car or SUV, our brands ensure that you have the options that you want, and with hundreds in stock, you will always find a vehicle with the right features for your needs. We also have an extensive pre-owned inventory, and our service centers are ready to get your car back on the road whether they need basic maintenance or extensive service. We also have one of the highest rated body shops in town and it can get your car looking just like new again. Since 1981, our family has served the needs of car-buyers right here in Eau Claire as well as all the surrounding areas even including La Crosse and the Twin Cities. We have over 100 employees that are ready to get to work for you, and they are non-commissioned, friendly, and happy to serve you and your family. What’s more, we provide free credit approval, free car washes, a guaranteed trade-in allowance, and the best price upfront. At Ken Vance Motors, Vance Says Yes! We are ready to get you into the car that you’ve always wanted.